Fabrizio Carbone and co-workers at EPFL open new perspectives for the selective carrier-density manipulation via near-infrared light. Exotic phenomena and novel functionalities emerge in solids due to the coupling between the charge carriers and collective modes of structural, electronic, and magnetic origin. Key to exploiting this phenomenology is the ability to tune the density of carriers and the strength of their coupling to such modes. To gain control over the electronic density of states, advanced materials have been designed. Alternatively, photodoping or phonon pumping has been attempted to control the electronic density of states or the coupling between carriers and collective modes. The advantage of such an approach is that light does not induce structural disorder and can access new states of matter that only exist out of equilibrium. Ultrafast techniques using visible light pulses have unveiled some of these phenomena by delivering excess energy to the electrons via an intense pump pulse and subsequently monitoring the transfer of such energy to the different underlying bosons via a delayed optical probe. Whenever a preferential electron-boson interaction channel exists, it dominates the carrier thermalization via simultaneous heating of the bosonic mode. Here, the authors used an ultrashort near-infrared laser pulse to set the σ-and π-electronic subsystems of MgB2 out of equilibrium and follow the change of the sample reflectivity ( ΔR/R) with a broadband probe covering the in-plane ( a axis) and out-of-plane ( c axis) plasma edges. The work shows that the photoinduced creation of a hot phonon bath in a multiband system can be used to selectively trigger a transient increase of the number of carriers in a given band, opening new perspectives for the selective carrier-density manipulation via near-infrared light. More generally, by setting a multiband system out of equilibrium, the microscopic details of the scattering mechanism between distinct electronic subsets can be unraveled via selective observables in the time domain. Figure: Illustration of the ultrafast dynamics of MgB2. After the interaction with the solid, the ultrashort laser pulse leads to the excitation of both σ and π carriers. 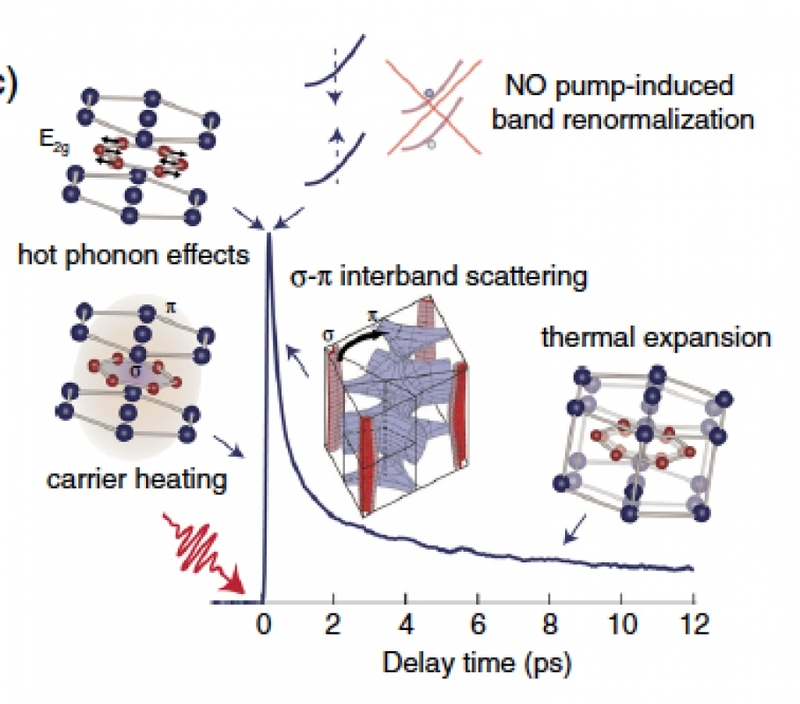 The nonthermal σ carriers are strongly coupled to the branch of the E2g phonon mode and efficiently generate hot phonons during the first 170 fs. Subsequently, the energy stored in the hot phonon subsystem is released to the π carriers via interband scattering and to low-energy phonons via anharmonic decay. The microscopic details of the interplay between the two subsystems in multi band superconductors were lacking to date and represent an important information for the manipulation of superconductivity in these type of materials.